NETWORK FINALS: There were no changes from the preliminary Wednesday broadcast ratings. CABLE HIGHLIGHTS: FX’s SNOWFALL had a solid launch at 0.58 (a tick behind its lead-in, the theatrical movie KINGSMAN). Discovery’s ALASKAN BUSH PEOPLE led the night, up 0.04 to 0.65, with lead-out HOMESTEAD RESCUE up 0.02 to 0.37. Bravo’s REAL HOUSEWIVES OF NYC rose 0.05 to 0.55. On MTV, CATFISH jumped 0.22 to 0.52 (it wasn’t listed as a finale, but perhaps some other special event?). 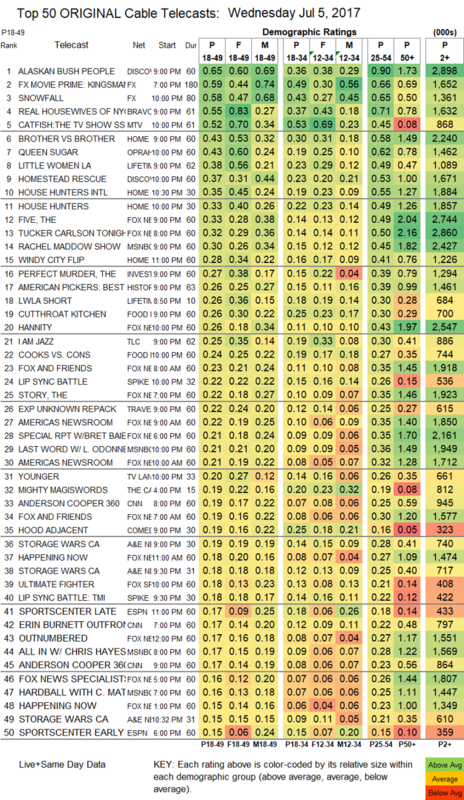 On HGTV, BROTHER VS BROTHER edged up 0.02 to 0.43, HOUSE HUNTERS INTL gained 0.07 to 0.35, and HOUSE HUNTERS ticked down to 0.33. OWN’s QUEEN SUGAR climbed 0.02 to 0.43. On Lifetime, LITTLE WOMEN LA dropped 0.04 to 0.38. Probably due to G-20 news, Fox News won the cable news night with THE FIVE at 0.33/2.7M, over MSNBC’s RACHEL MADDOW SHOW at 0.30/2.4M, and CNN’s ANDERSON COOPER 360 at 0.19/945K. ID’s THE PERFECT MURDER added 0.03 for 0.27. 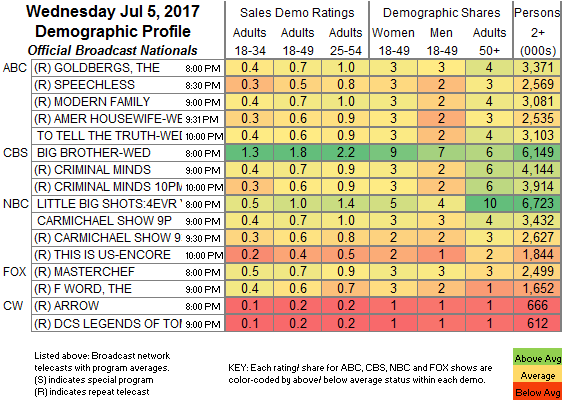 Food Network’s CUTTHROAT KITCHEN was at 0.26, well above last week’s 0.16/0.18, and COOKS VS CONS returned at 0.24. On TLC, I AM JAZZ slipped 0.02 to 0.25, and HAIR GODDESS was down 0.01 to 0.15. Spike’s LIP SYNC BATTLE fell 0.03 to 0.22. TV Land’s YOUNGER dropped 0.07 from last week’s season premiere to 0.20. Comedy Central’s HOOD ADJACENT ticked up to 0.19. Syfy’s BLOOD DRIVE was steady at 0.13. BBCAmerica’s BROADCHURCH was down 0.01 to 0.05. Sundance’s CLEVERMAN remained off the chart at 0.02/76K. POP’s NIGHTCAP was even worse at 0.01/95K.